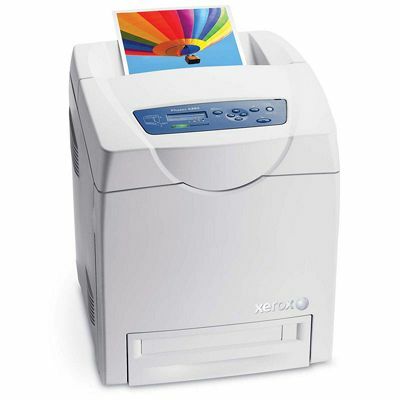 The Xerox Phaser 6280DN has been designed especially for use in smaller workgroups and offices. It is a hard-working, highly productive machine colour laser printer that promises high speeds and great standards even for users who don’t have a lot of space to spare. The small footprint of this machine makes it perfect for businesses or workspaces where space is at a premium, while the 400-sheet input capacity trays show that the Xerox Phaser 6280DN really means business when it comes to productivity. It’s not all just about volume, however, as this machine offers a print speed of up to 30ppm in monochrome and print resolution of 600x600 dpi. This relatively compact machine comes in an attractive but unobtrusive colourway of white and petrol blue, with a simple design that prioritises saving space. The measurements are roughly 400 x 490 x 473mm, with an approximate weight of 24.5kg. The printer has a small LCD display screen with a classic pushbutton control panel for ease of use. The main advantages to the Xerox 6280DN are its paper handling and productivity. With a 400-sheet input capacity, divided between a 250-sheet drawer and 150-sheet multipurpose tray, you can even add an extra 550-sheet tray, bringing the total up to 950-sheet capacity. The printer also comes with an automatic duplexer, which helps offices lower their overall environmental impact while also helping to reduce their overall operating costs. When it comes to speeds, the Xerox Phaser 6280DN doesn’t disappoint, with 30ppm in black and white and 25ppm in colour. It also promises a first-page print speed of just 10 seconds. The aging Xerox Phaser 6280DN is currently off the market, although you can still easily purchase the appropriate toner cartridges. It’s also worth noting that although this printer offers great figures when it comes speed and productivity, it can be a little on the pricey end of the scale when it comes to operating costs compared to other models in the same class.